After a few posts on the use of Adaptive Components for Post Tension Tendons, it’s now time to take it a bit further. Some Reviteers out there might have had the chance to look at Image-O-Matic from Boost Your BIM (boostyourbim.wordpress.com and twitter.com/BoostYourBIM). This App will turn your Revit Views into series of images. These images can in turn be used to create videos in different ways. I’ve installed Windows Movie Maker and produced an mp4 for YouTube. Pretty straight forward stuff. There are a few things to keep in mind when you play around with Image-O-Matic. 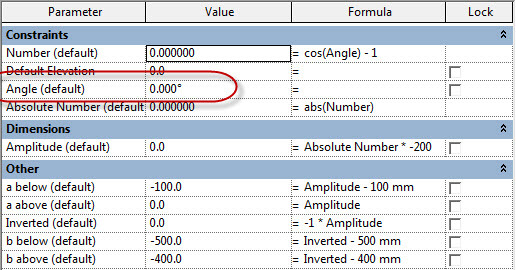 It’s only for Imperial units, so you might want to make use of some converter parameters or switch back and forth between units in your Revit project. I prefer to use unit-less parameter types like Numbers or Integers in formulas with the Length parameters that control geometry. Also, the App will only use one parameter. That means you have to be a bit creative with formulas (again) if you want to control multiple geometry. Last, the App will not be available when you’re in a perspective view (like all other Add-Ins). Solve this by starting the program in another view, and move to a perspective view when selecting the family. These are the parameters and formulas I’ve used to make the animation above. The Angle parameter, which has the same units in Metric and Imperial, is used by Image-O-Matic for changing geometry. Using the trigonometrical function I get an accelerated movement in between the top and bottom extremes, where the movement decelerates. Probably totally and utterly useless for anything, but quite fun to play with. This entry was posted in Tips and tagged Animation, Reinforcement, Revit on March 7, 2013 by Håvard Vasshaug.